Sqwiggle supports more than video presence and video chats, you can use it as your team’s event and message feed as well. Last week the Sqwiggle team announced their new API, which you can now use to push events into your team’s streams from an external source. 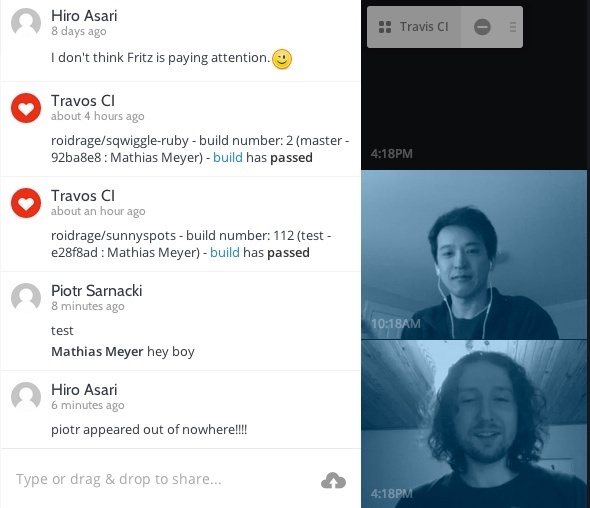 Today we’re happy to ship support for pushing Travis CI build results into your Sqwiggle streams! First up, make sure you’ve signed up for a Sqwiggle account. It’s free to try and free for teams of up to three people. Next, create an API client. Make sure to copy the API token shown as it will only be shown to you once. The room can be identified by its path name or by its identifier, which you can fetch via the API. The path name is easier to fetch, you just need to copy the last part from the URL of the room you’re in. Here’s the resulting stream with a few build notifications trickling in. Be sure to encrypt these credentials using our travis command line tool. You can notify multiple Sqwiggle rooms too, just add the rooms key and specify the list of rooms. Our thanks to Luke from Sqwiggle for contributing the notifications code!